Lettuce is a leafy vegetable grown for consumption that is commonly used in salads and sandwiches. Lettuce was first grown by the ancient Egyptians for production of oil from its seeds, and is now grown worldwide due to its versatility and use in global cuisine. Historically, due to its short lifespan after harvest, sale of lettuce was limited to the immediate area in which it was grown. 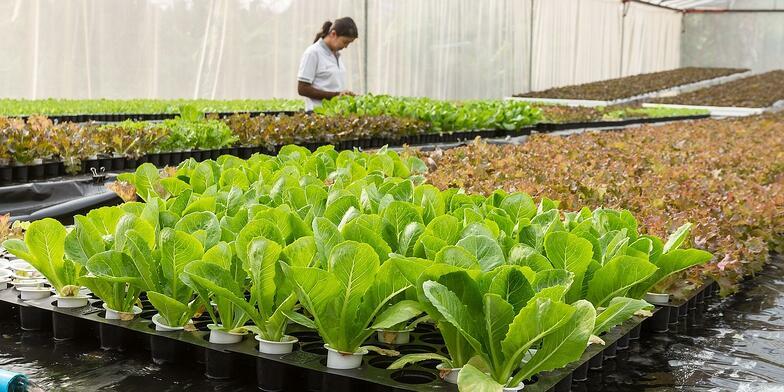 Advancements over the last century in packing, storage, and shipping technologies have improved the lifespan and transportability of lettuce, making it a grocery store staple. One of these advancements is processing lettuce into premixed salads. In these salad blends, an assortment of lettuce varieties are mixed together, sometimes with other vegetables, and packaged for sale. These convenient salad packages come prewashed and ready to eat for an affordable, healthy, and fast dining option. Salad mix producers purchase fresh harvested lettuce directly from farmers for processing and packing. From the farm, the lettuce is transported to processing plants in refrigerated trucks. The lettuce is offloaded onto conveyer belts, where it is sorted and chopped. The lettuce then undergoes a vigorous cleaning and disinfection process before packing. First, the lettuce goes through a rinse bath to remove the dirt and debris. Depending on the field conditions at the time of harvest, the lettuce can have varying amounts of dirt on the surface of and in the crevices of the leaves. If harvest immediately followed a large precipitation event, more dirt and debris will be present than if the weather had been fair. Once the lettuce is sufficiently rinsed, it continues along the conveyer belt to a sanitizing bath, typically comprised of a dilute chlorine solution. The lettuce is cleaned, sanitized, and placed in a rapid spinner where all the excess water is removed. The lettuce is then sorted, mixed, packaged, and distributed to stores. A lettuce processing facility contacted Hanna Instruments seeking a solution for monitoring the turbidity in their rinse baths. Primarily, the customer was refreshing the water in their rinse baths on a timed schedule. However, the customer was also monitoring the turbidity of the rinse baths; they found with "dirtier" batches of lettuce, the rinse baths needed to be refreshed more frequently to ensure proper cleaning. If the turbidity of a rinse bath exceeded a certain threshold, the bath was immediately refreshed and the frequency of the rinse water exchange was increased for the remainder of the lettuce shipment. The customer was currently required to bring their water samples back to the laboratory to take turbidity measurements, and was looking for a portable solution that allowed them to do more frequent testing on the processing floor. Hanna Instruments recommended the HI93414 Turbidity and Chlorine Portable Meter. 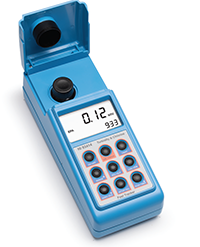 The HI93414 comes in a convenient carrying case with everything needed for turbidity measurement, including calibration standards for up to 4-point calibration from 0 NTU to 750 NTU, sample cuvettes, and a microfiber cloth for wiping the cuvette glass clean of fingerprints. 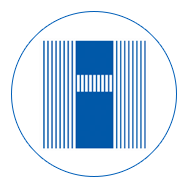 The customer appreciated that the included Turbidity Calibration Standards - HI98703-11 came with a certificate of analysis including lot number and expiration date, ensuring they could be confident in the accuracy of their calibration. The customer was pleased that the multiparameter functionality of the meter allowed them to test the turbidity of their rinse baths, as well as the free chlorine in their sanitizing baths with one instrument. The HI93414 provided a comprehensive portable solution for their lettuce rinse and sanitizing bath testing needs.